Capt. Rick is a Fly Fishers International certified fly casting instructor. He offers both private instruction and instructional fly fishing trips. For the beginning fly angler, he will focus on terminology and the essentials of fly casting. You will get a good understanding of basic casting, false casting, roll casting and shooting line. Leader construction, flies and fish fighting techniques will also be covered. If you’re an intermediate fly angler and comfortable with the basics, Capt. Rick can work with you to improve your casting skills or correct any bad habits. Learn to double haul to increase distance and cope with wind. You will also learn to control line, cast to a target and cast shooting heads or sink-tip lines. You might also consider an instructional fly fishing trip. Put the casting skills you have learned to use on the water. This will give you an opportunity to deal with fishing situations from the deck of a boat or by wading. Learn how to cast under mangroves and docks and how wind and current affect different fishing situations. You may have an opportunity to practice sight-fishing, which is one of the most rewarding forms of fly fishing! You might want to attend one of CB’s Saltwater Outfitters fly fishing schools (below) which will give you a good foundation to build on. CB’s Saltwater Outfitters, 1249 Stickney Point Rd, Sarasota, FL have announced dates for their Orvis-Endorsed fly fishing schools for the winter and spring; Jan 20, Feb. 24, Mar. 24, and Apr 14, 2018. 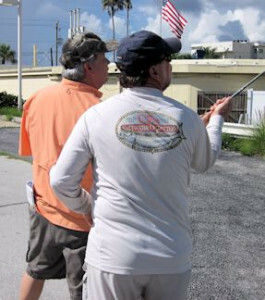 Located on Siesta Key, named Best Beach in America, the schools will cover fly casting basics, line control, shooting line and the roll cast. Instructors, Capt. Rick Grassett and Capt. Ed Hurst, will also cover leader construction, fly selection and saltwater fly fishing techniques. The course, designed for beginning and intermediate fly casters, will focus on basics but also work with intermediate casters on correcting faults and improving casting skills. Cost for the schools, which will run from 8:30 AM to 2 PM, is $175 per person and includes the use of Orvis fly tackle and lunch. Contact CB’s Saltwater Outfitters at (941) 349-4400 or info@cbsoutfitters.com to make reservations. Capt. Rick Grassett works with a student on their back cast at a CB’s Saltwater Outfitters Orvis Fly Fishing 101 class.